Russian scholar and author; born at Keidany, government of Kovno, Oct. 22, 1843. From his father he learned the calculation of the course of the stars in their relation to the Hebrew calendar ("Ḥaṭṭot Ne'urim," i. 15). At the age of thirteen he organized a society of boys for the study of "'En Ya'aḳob" (ib. i. 14); and at the age of fifteen he married and settled at Wilkomir. A change in the fortunes of his father-in-law throwing him upon his own resources, Lilienblum established a yeshibah in Wilna in 1865, and another in the year following (ib. i. 53-54). The advance of years, however, wrought a great change in the attitude of Lilienblum toward Judaism. He had read the writings of the Maskilim, particularly those of Mapu and M. A. Ginzburg, and these produced in him a feeling of dissatisfaction with Talmudic studies and of abhorrence for the ignorance and superstition surrounding him; he decided, therefore, to combat these faults. In an article entitled "Orḥot ha-Talmud," in "Ha-Meliẓ," 1868, he arraigned the superstitious beliefs and practises of his people, demanded the reform of Judaism, and insisted upon the necessity of establishing a "closer connection between religion and life." This article, followed by others of the same nature, stirred up the Jewish communities in Russia, and a storm of indignation against him arose among the ultra-Orthodox; he was denounced as a freethinker and continued residence in Wilkomir became impossible. He then went to Odessa (1869), where he intended to prepare himself for the university ("ḤaṭṭotNe'urim," ii. 3), but after a hard struggle he was compelled to give up that design. The anti-Jewish riots of 1880 and 1881 aroused Lilienblum to a consciousness of the unsafe position of the Jews "in exile," and he gave utterance to his apprehensions in an article entitled "Obshcheyevreiski Vopros i Palestina" (in "Razsvyet," 1881, Nos. 41, 42), in which he points to the reestablishment of the Jews in Palestine as the only solution of the Jewish question. This article did not remain without results; the idea was hailed as practical, and many set themselves to realize it. In 1883 a committee was organized at Odessa for the colonization of Palestine, Lilienblum serving as ṣecretary and Dr. L. Pinsker, author of "Autoemancipation," as president; at the famous conference at Kotowitz, where representatives of all European Jewries met and discussed plans of colonization in Palestine, the foundation was laid for the Zionist movement, in which Lilienblum, as secretary, has taken the most earnest and energetic part ("Derek la-'Abor Golim," p. 16). Lilienblum's activity thus covers two distinct periods in the history of Russian Jewry. 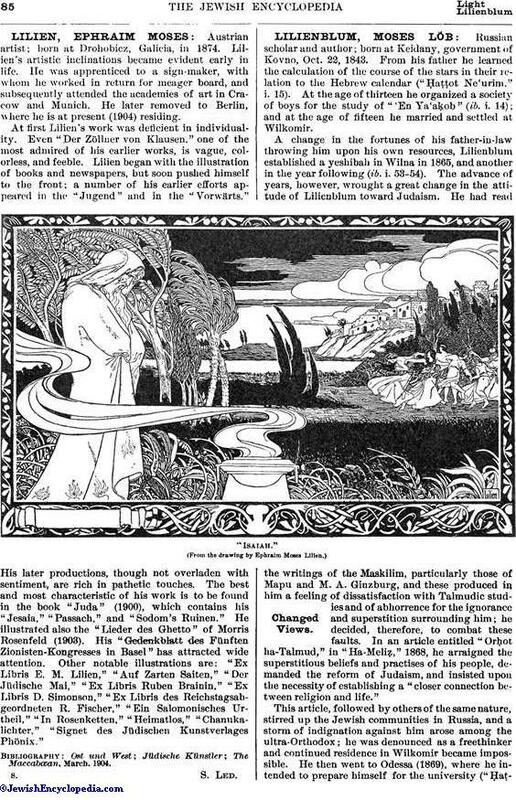 In the period of the Haskalah he followed the example of the Maskilim in demanding the reform of Judaism; but he differed from the Maskilim in that he was much less extravagant, his style being free from the flowery "meliẓah" used by them, and his ideas being marked by soberness and clearness. His "Orḥot ha-Talmud," mentioned above, and his "Ḥaṭṭot Ne'urim" (Vienna, 1876), a description of his material and spiritual struggles, both made a marked impression upon that period. His influence in the second period also, that of national reawakening, which he practically initiated, was due to his characteristic style. In his article on the Jewish question and Palestine, already mentioned, as well as in his "O Vozrozhdenii Yevreiskavo Naroda" (Odessa, 1883), the latter including the former and other essays of a similar character, he clearly and soberly presents the anomalous position held by Israel among the nations and logically demonstrates its hopelessness except through national independence. Lilienblum wrote also: "Ḳehal Refa'im," a poem describing the different types of Russian Jewry of the time, as they appear in the nether world (Odessa, 1870); "'Olam ha-Tohu," on some phases of Hebrew literature (in "Ha-Shaḥar," 1873); "Biḳḳoret Kol Shire Gordon," on J. L. Gordon as a poet (in "Meliẓ Eḥad Mini Elef," St. Petersburg, 1884); "Zerubbabel," a historical drama in Yiddish (Odessa, 1888); "Derek la-'Abor Golim," a history of the Chovevei Zion movement up to the time of the ratification by the Russian government of the committee for the colonization of Palestine (Warsaw, 1899); "Derek Teshubah," an addition to "Ḥaṭṭot Ne'urim," describing the transition of the author from the negative period of the Haskalah to the positive period of national reawakening; "Pyat Momentov Zhizhni Moiseya" (in Russian; ib. 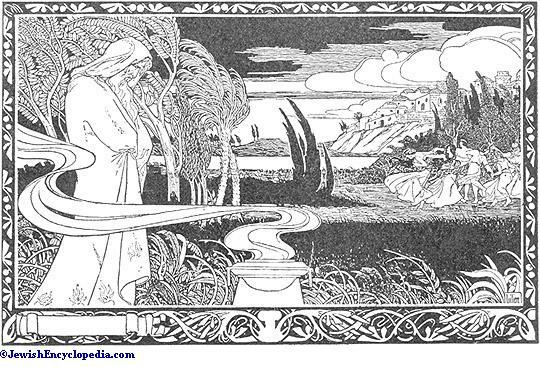 1901), a psychological analysis of some important moments in the life of Moses. 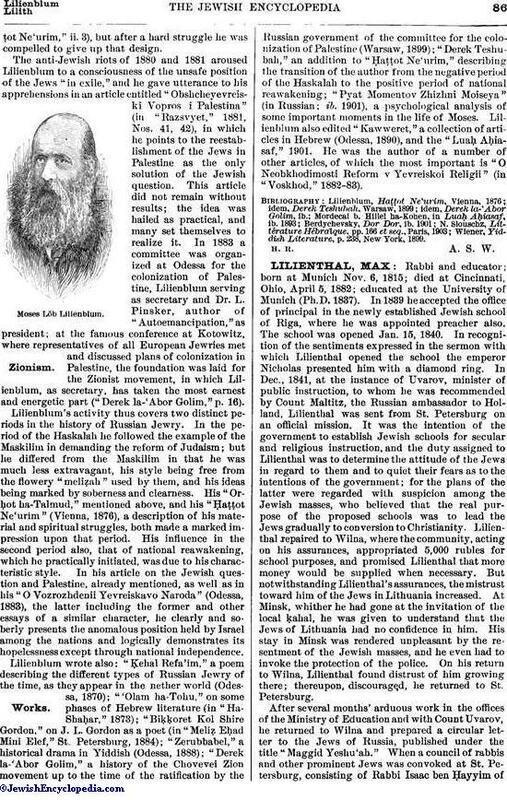 Lilienblum also edited "Kawweret," a collection of articles in Hebrew (Odessa, 1890), and the "Luaḥ Aḥiasaf," 1901. He was the author of a number of other articles, of which the most important is "O Neobkhodimosti Reform v Yevreiskoi Religii" (in "Voskhod," 1882-83). Wiener, Yiddish Literature, p. 238, New York, 1899.